It’s been a wild ride for Arena of Valor (Free) fans this week. Between the World Cup Group Stage kicking off, and getting our first real look at the rest of the world’s competition, a major new skin was just revealed after a lengthy tease, and we finally know what Tencent was talking about when it started to throw Swag Sunday hashtags all over the show. So let’s check it all out! After 3 somewhat short days of competition, the AWC Group Stage Quarter Final kicks off later today. The very PDT-friendly timing of it all means this individual couldn’t feasibly watch a single match without expecting a very rough morning and swift productivity call, but catching up via the official Arena of Valor Esports Twitter account make things a little easier to manage. Simply put, North America just managed to scrape a Top-8 finish to put themselves into the next leg of the competition. After a demoralizing 2-0 loss to Thailand in the opening moments of Day 1, North America came back in Day 3 to crush Singapore the same way. The same could not be said for Europe, losing to both Korea and Chinese Taipei Wildcard in Day 2 and 3. They put up a better fight against the latter, but it wasn’t enough to push them forward. On the worse end of the spectrum, South America lost in a 2-0 fashion to both China and Thailand Wildcard, denying them a place in today’s competition. So from the 3 regions we typically cover, only North America managed to fight their way to the top-8 – and just barely. You can watch their post-game interview here. 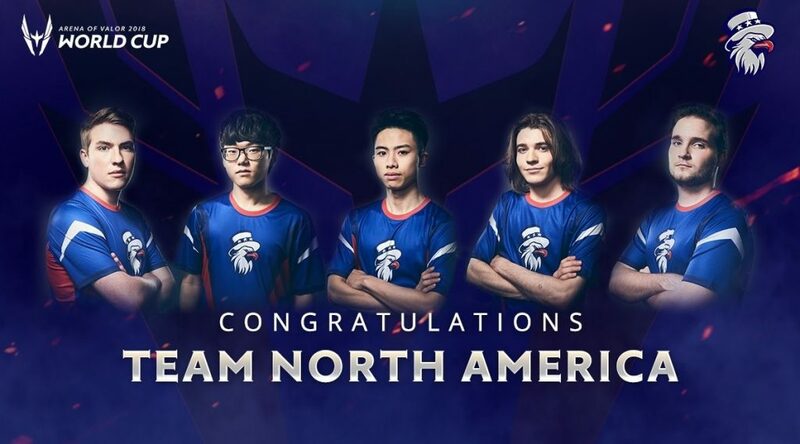 Arguably one of the best things to come of the first worldwide Arena of Valor competition is just how many top-tier players it’s brought over to the U.S. These professional players need somewhere to practice between their big matches, and stomping all over the North America server is how Sun, Team Korea’s leading attacker, decided to spend his time. 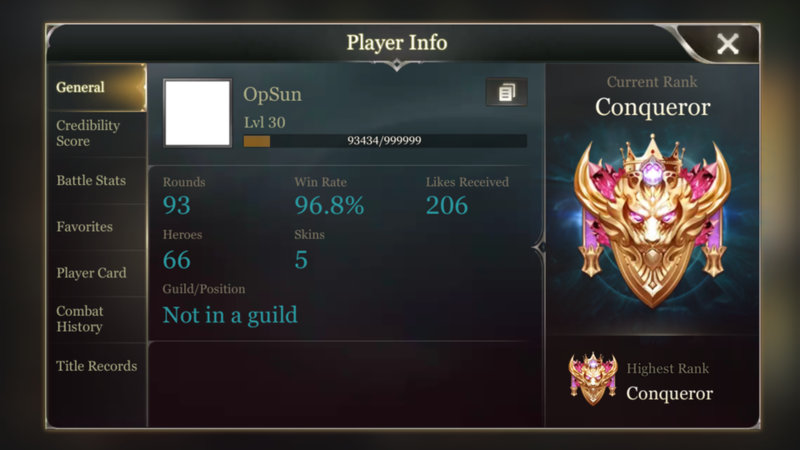 Sun wasted no time showing the North America server how it’s done, crushing the Ranked competition and climbing to its highest rank, appropriately named ‘Conqueror’, in just one week with a 96% win average across 93 games. He lost one match. One match out of 93. And the showoff didn’t go unnoticed. Redditors chimed into this thread to share their experience of fighting for and against such a competitive powerhouse. One confirms his was queuing solo during at least one of the matches, with another explaining how Sun refused to let him have the blue buff. There was probably a reason for that, buddy! If you remember our AWC Group Stage post toward the start of the week, there was a mention of something called ‘Swag Sunday’. We didn’t know for sure what exactly that mean, or even whether it was something the general non-AWC attending public would be eligible for. But as we inch closer to that very Sunday, we now know what we’re (all) in for – a free DC superhero! It’s safe to say some of Arena of Valor’s allure and eventual popularity came through its frequent flaunting of the DC license. The likes of Batman, Superman, Wonder Woman, The Joker, and even the The Flash, are available as playable fighters. And while they may come at a premium through the in-game store, Tencent seem to be giving them away this Sunday. From what we can gather, simply logging in next Sunday, July 29nd, is all you need to do to secure a single DC superhero (or villain) of your choice. Obviously this won’t mean much to those who’ve already picked each one up, but it’s a great way for those without the expendable income to support their favourite DC character. 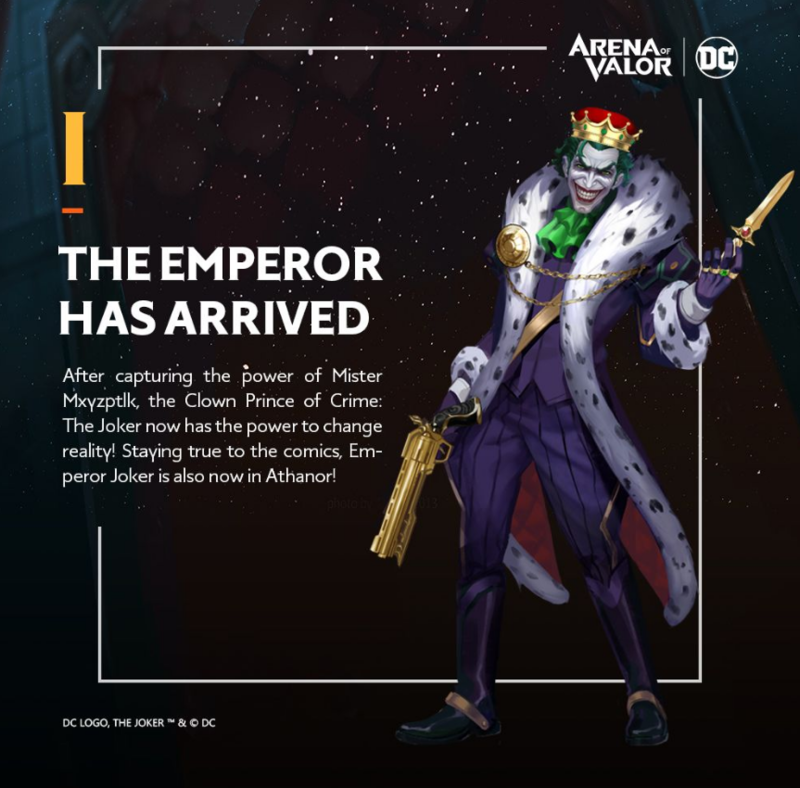 Better yet, it comes just in time for the new Emperor skin for The Joker. Teased around a week ago now, The Joker is looking much more dapper in his new coat. Toward the start of the week, community manager Nick Zazzer took to the official Arena of Valor discord channel to announce the result of a little ongoing investigation. It’s difficult to pinpoint when this all started, but Tencent seemingly noticed a trend of reports that suggested their way some degree of ‘Win Trading’ going on in Ranked play across the NA/Canada/LATAM servers. Since the reports, Nick has confirmed that 9 accounts were found to be conducting in the shady activity and have been slapped with 30-day bans; with harsh penalties awaiting should they do it again. The sting operation is likely far from over, but the early announcement should go out as a warning call for anyone thinking they can’t be caught. A little later on in the week, Nick posted yet again to confirm an undocumented change that was applied to the Ranked season unannounced. Automatic rank demotion has been extended from Bronze to Silver ranks. Meaning once you’ve climbed into Silver, you won’t be send back down no matter how many times you lose. Yoshitaka Amano Collaborates With Arena of Valor – But Why? If you pay much attention to the Arena of Valor YouTube channel, you may have noticed a familiar name pop up on your subscription notifications toward the end of last week. Yoshitaka Amano – of Final Fantasy fame – starred in a sort of mini-documentary explaining how his famous art style is similar in nature to the Arena of Valor World Cup. The legendary artist explained how his artwork is designed to all come together in the centre of page, noticing how the AWC brings players together to fight over their own centrepiece – the Arena of Valor World Cup trophy. All of these little nuggets of wisdom come about as Mr. Amano paints a collage of popular AoV heroes. Maybe we’re reading into it a little too much, but having a very famous Japanese fantasy artist produce work for a game that isn’t even available in his home country seems a little odd. Sure, Amano has fans the world over, but having his artwork represent the game during a Japanese launch could have been a major asset. We just don’t think this is a one-off event.